There are many other places in Chicago to visit but this is the 'carnival' of Chicago. There are boat rides, games, shopping, ferris wheels, a beer garden and more on this long pier on beautiful Lake Michigan. Walk outside and inside. There is a lot to see packed into this place. Our visit was during spring break when the wind was cold and the days short. Even then, this was a great place to spend a bit of time. 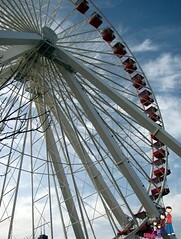 Ride the Ferris Wheel for great views of Chicago and Lake Michigan. 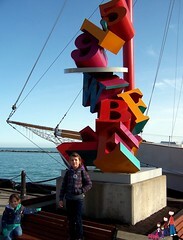 Take photos with the stacked blocks and ship anchor. Wander indoors to view some amazing Tiffany stained glass. Surely much busier in the summer, but you still don't need to spend a lot of time here. Skip the restaurants- food is average and overpriced.